IMPORTANT NOTE - Due to a recent change in circumstances, Friday & Saturday night's are no longer routinely available. Please inquire if you require a weekend booking. Welcome to our home in Cambridge! We have just built this brand new room on to the back of our home. We are a family who enjoy hosting people from all walks of life. We have poured so much love into this space and tried to make it as unique and welcoming as our own home so you will feel like you're staying with friends, not strangers. Cambridge is a vibrant, thriving little town with beautiful farmers markets, artisan breads and delicious coffee. Cambridge is beautiful to bike around and if you need bikes, just ask. We have 2 available if you would like to explore our little town. We love meeting our guests. We can give you information about all the best places to eat, shop, drink coffee, go surfing etc. However, if you prefer your privacy, that's absolutely fine. We have been married for 17 years and have 4 kids. We love meeting people from all walks of life and consider good hospitality one of the most important things a family can do. 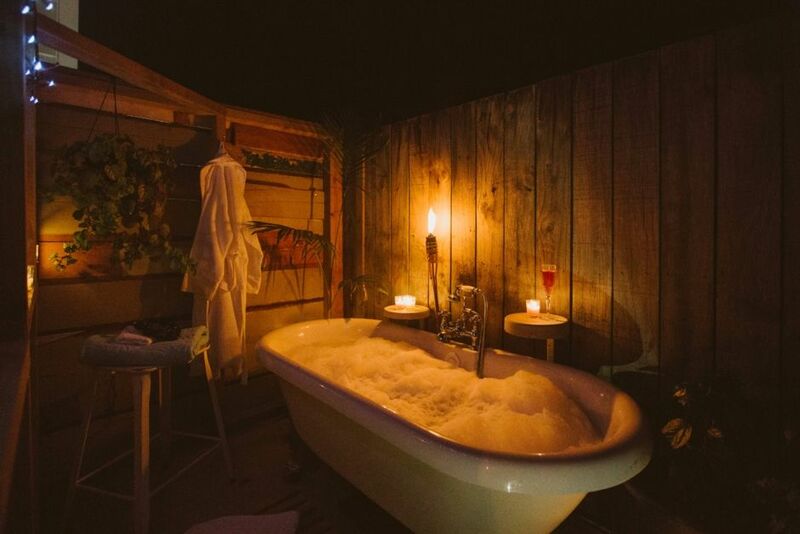 Outdoor bath - bathe under the stars. Can be used all year round. Gas plumbed so plenty of instant hot water. Myself and my husband spent 3 lovely nights in this accommodation. It is quaint and small but has everything you need. We didn’t expect the breakfast supplies so that was great. We spent 2 days at the dragon boat nationals so came home to the outside bath, and this was a blessing. There is an outside fireplace in a courtyard area they we unfortunately didn’t get to enjoy because we we out everyday. The hosts are lovely and very accommodating. We definitely recommend this accommodation and will hopefully get to stay here again. A big thank you to Danielle and your whanau for having us. Cosy and comfy bed with lovely outside bath! A cosy room really nicely set out. A lovely outside bath, with candles and fairy lights The bed was very comfy. The bathroom area was well appointed and lovely lush towels . We enjoyed our muesli and yogurt also . Thank you. Quaint little B&B is at back of Family Home. Living/Bedroom very small, bed takes up most of room with a box ottoman at end of bed. No inside seating but we were out most of day and night so was ok. Minimalistic area for appliances, dish wash up. Tastefully decorated bathroom and host had added vase of fresh flowers. Quality towels and linen. Lovely outdoor area with nice outdoor furniture and sun umbrella, Weather was great so we were able to sit outside and enjoy breakfast. Breakfast supplies, first class and sufficient for our 5 night stay. Our days/nights were busy so no chance to use the outdoor bath or light the outdoor fire which was all nicely set up ready to go. It's just as described/pictured - gorgeous wee studio that was just right for two. Beautifully decorated with extra comfy touches. We only wish we were staying longer to take advantage of all that you offered! Thank you so much for having us. What a beautiful place! So homely, cosy, with everything you need for a wonderful weekend away from the hustle and bustle. We loved the outdoor bath and the fire, perfect way to end our evening in Cambridge. The hosts were great and even brought us in some freshly made coffee in the morning. Thank you so much for having us stay!